We five, the Ex, ChioBu, ChioButch, Mao Mao and I go to Geylang, the underbelly of Singapore for makan. I tell you, although I am an Beng, it’s really quite scary here, like any time, a gang fight will break out and people carrying parangs will run down the street. 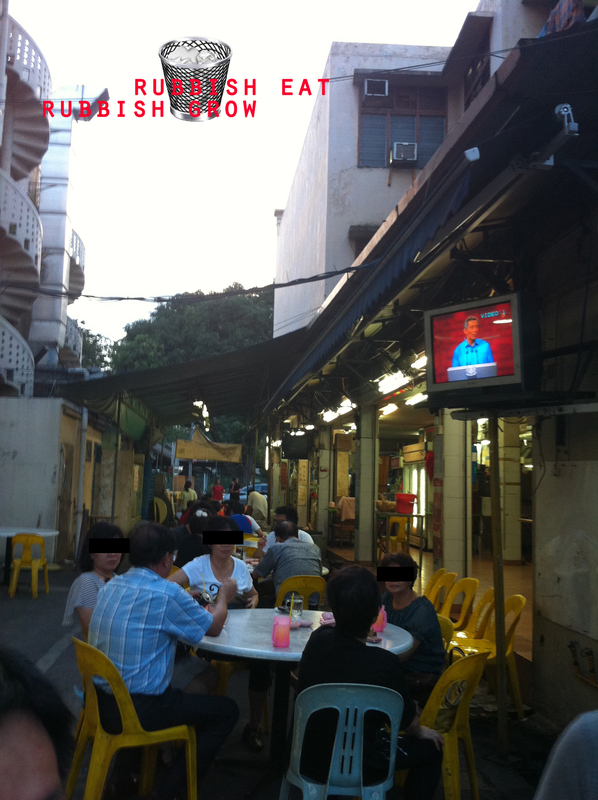 JB Ah Meng has seats along the alleys and there are many Mao Mao’s fellow countrymen around but they look rather shady. They were there mostly for duck’s neck from other shops. The service there was like… no service. There was only 1 woman clearing tables and taking orders and there were so many people dying of starvation, waiting to eat. We waited and waited and waited. We ordered all the dishes recommended by Makansutra. 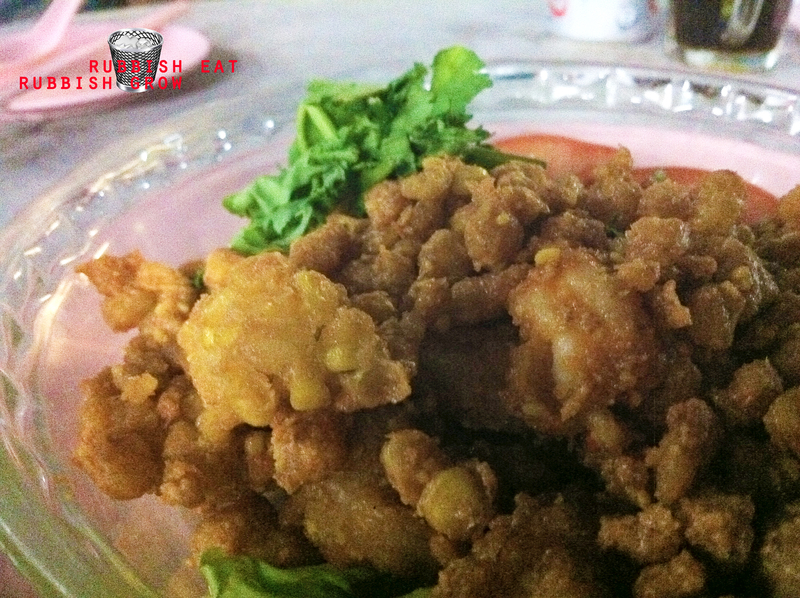 The deep fried salted egg yolk prawn (pictured above) is average–not the best one I’ve eaten, and no enough sauce–but it comes with fried corn kernels, went very well with salted egg yolk sauce, delicious! 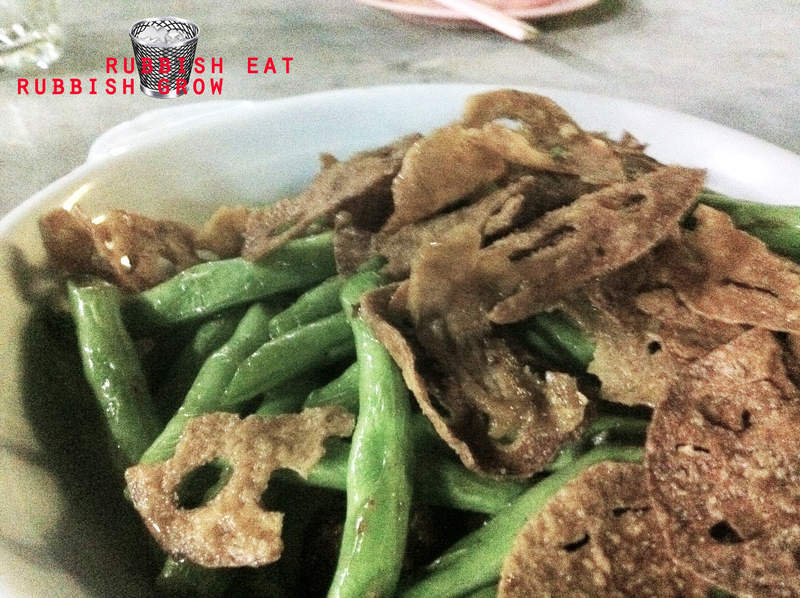 The deep fried lotus roots with stringbeans (pictured above) was ordinary and the deep-fried roots tasted like chips. So was the stir-fried beef. 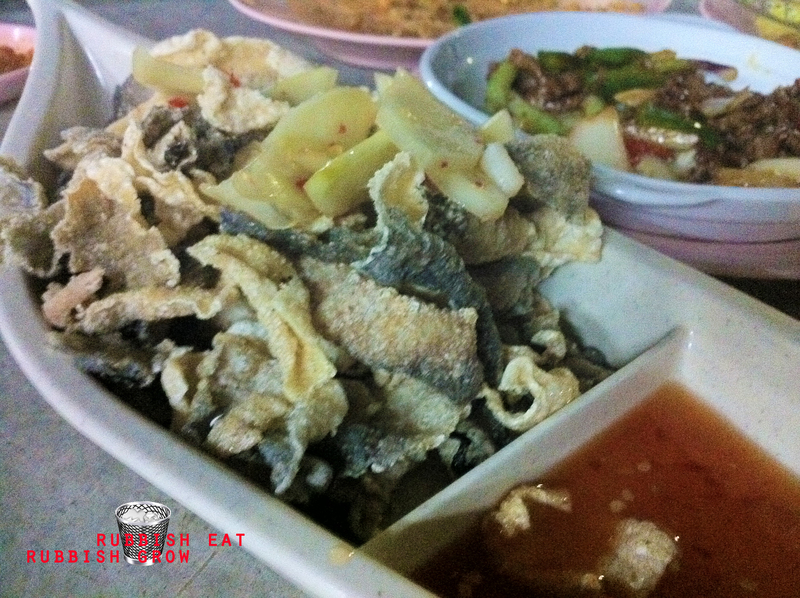 The fried fish skin (pictured above) with a tangy spicy dip should compliment beer extremely well. Not at all oily. Crisp and tasted like fish crackers. But they forgot this order, and we had to remind them, so instead of being an appetizer, it became a dessert. Spicy eggplant with potatoes was excellent. The eggplant didn’t have the gluey texture but was rather firm. What is most memorable is the 3-storey fried beehoon, which is fried in flatten pancake style. It was bursting with flavors and lard, I didn’t know beehoon can taste like that. For such ugly looking beehoon, like a bad hair day, it was marvelous. We spent about $15 each for 5 people, 6 dishes. Love the Gangster ambience–not for the faint-hearted though–and awesome food. But hate the waiting and service. I can’t stand waiting.